Does National Unity Have To Be A Casualty Of Canada's Energy Debate? In a recent panel discussion, Environment Minister Catherine McKenna assured Albertans that the Liberal government would not risk damaging "national unity" by acting quickly on climate change. For some, her comment begs the question: when exactly will the Liberals be ready to start acting on their emissions reductions targets? Workers are laying down their tools across the Canadian oilpatch as the price slump draws on. Alberta had a net loss of nearly 20,000 jobs in 2015, with skilled workers being laid off and little hope in sight. The reaction, then, to talks of climate action has been often hostile, with people fearing more economic damage from carbon pricing or other new environmental regulation. "We have the skills to build the renewable energy infrastructure required for Canada to meet their climate target," Hildebrand told CBC News. "That will open up a huge amount of opportunity for us if we can start diversifying our energy grid and it would ensure that we are less vulnerable to price fluctuations." The new organization brings a fresh perspective to a longstanding perceived tension between climate action and its spinoff benefits and the fear of damaging existing emissions-intensive industries. "Climate policy that is effective -- by that I mean significantly reduces emissions over two decades -- will challenge national unity in most countries," says Mark Jaccard, a professor in the School of Resource and Environmental Management at Simon Fraser University. The tone since the Liberals took office has been to reassure Albertans that the climate police aren't coming to kick them while they're down. Trudeau's "Canadian approach" to climate change action has thus far meant that little in the way of concrete policy has been set down to meet his ambitious Paris goals. NDP Leader Thomas Mulcair came out this week in support of a carbon price to keep oil in the ground, saying the political will to get it done has been lacking so far in Canada. Federal plans to put a price on carbon, while supported by most of the premiers, have met the expected opposition from fossil fuel industry boosters like Premier Brad Wall, who handily won a third mandate this week in Saskatchewan. "Don't set a climate target that is ambitious if you're not willing to take on national unity," Jaccard says. "It's one or the other; they're trade-offs." 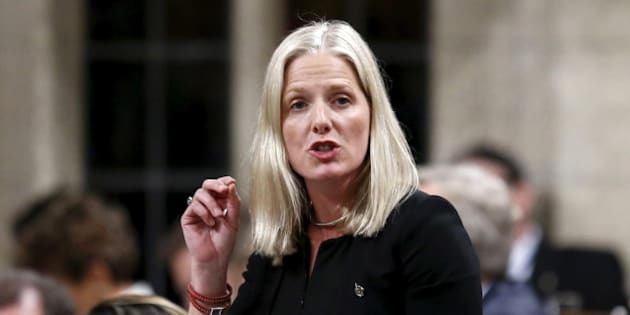 McKenna's comments frame the notion of climate change action as something that can potentially be done gingerly, with the cooperation of emissions-intensive industries, doing little to disrupt the status quo. Environmental psychologist Renee Lertzman says this kind of wishful thinking is not a helpful way to approach a complex issue. "It sounds to me like it's a mode of leadership that's not really applying...emotional intelligence," says Lertzman. "As humans we have tremendous capacity and capability to deal with this. When we communicate in ways where we're trying to be cautious we can unintentionally send a message that's deeply disempowering. What's most needed, in fact, is leadership that's deeply empowering, that's above-board, that's compassionate but grounded and strong." She echoes a sentiment expressed by Naomi Klein in a recent op-ed for The Nation, in which she skewered Hillary Clinton's "corporate worldview:"
"For [climate action] to happen, fossil-fuel companies, which have made obscene profits for many decades, will have to start losing," she writes. "﻿And losing more than just the tax breaks and subsidies that Clinton is promising to cut. They will also have to lose the new drilling and mining leases they want; they'll have to be denied permits for the pipelines and export terminals they very much want to build. They will have to leave trillions of dollars' worth of proven fossil-fuel reserves in the ground." There is also a growing cost to delaying action on climate change. Consequences are compounding and tipping points are approaching, and every investment in fossil fuel infrastructure like oil pipelines, LNG facilities or coal ports further commits the Canadian economy to emitting more, not less, into the future. "Once you go down that road, you may not be able to turn back," said Naomi Oreskes, Harvard professor and author of Merchants of Doubt in an interview with The Tyee last week. "And if you can't turn back, then you're looking at four degrees of climate change, metres of sea level rise, and massive intensification of extreme weather events." This kind of grown-up discussion about the current direction and how and when to slam on the brakes is lacking in Canada, seemingly out of respect for Alberta's fiscal trauma. It's times like this, however, that Lertzman says traumatized people most need to hear the truth spoken plainly.